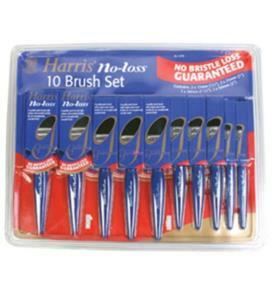 The Harris 10 brush set is suitable for use with all types of gloss, emulsion undercoat and varnishes. The bushes are made from special man-made bristles, which enables strict control on shape and length. Harris guarantee these brushes against bristle loss for life from the very first use. Holds as much paint as a natural bristle brush.